Why is it whenever I sit down to read a book, something for pleasure, my dog comes over and paws at me consistently until I respond? Much of the day, he lays around, snoring. When I’m running around doing house stuff. When I’m paying bills. When I’m procrastinating and really would appreciate his pawing need to be entertained. So, I try to satisfy him by petting him with one hand while I turn pages with the other hand. Not enough. He tries to paw the book out of my hands. I eventually give in. Chase him. Throw his chew toy. 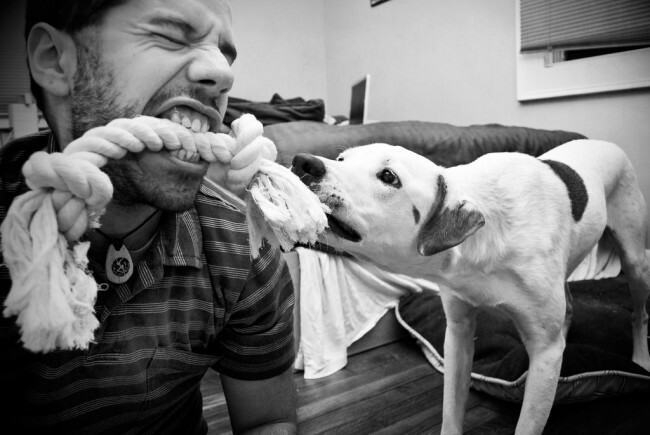 Play tug of war. Admittedly, I have fun. A lot of it. I love to read but there is nothing like bringing joy to another living creature. I love to read but in this case, reading can’t compete.